Jan. 11 (Bloomberg) -- Posco, Asia’s most profitable steelmaker, is set to report the highest net income in six quarters as prices recover. Further growth depends on $30 billion in overseas expansion. Chief Executive Officer Chung Joon Yang last week added plans for a $7 billion plant in India’s Karnataka state to a $12 billion project in Orissa in the south Asian nation and a $6 billion Indonesian plant. Together with an investment in Vietnam, the South Korea-based company may leap from fifth-place to regain its spot as Asia’s largest steelmaker. Chung, 61, who took the helm in February, wants to regain ground lost to China’s Baosteel Group Corp. Three years of delay at the Orissa project and slowing domestic growth weighed on the stock, with Posco lagging behind ArcelorMittal, the world’s largest mill. Riddle me this bears. Why is PKX spending $30 billion if the economy is going to double dip? And you still don't think X is going to 93? Pssst. 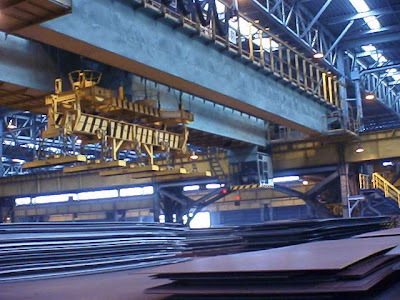 How about "scarcity" value for a steel plant, and expanded multiples?